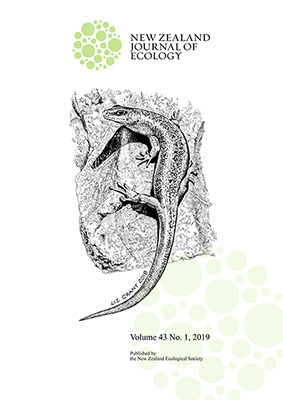 The New Zealand Journal of Ecology is a peer-reviewed journal publishing ecological research relevant to New Zealand/Aotearoa and the South Pacific. It has been published since 1952 (as a 1952 issue of New Zealand Science Review and as the Proceedings of the New Zealand Ecological Society until 1977). The Journal is published by the New Zealand Ecological Society and is covered by Current Contents/Agriculture, Biology and Environmental Science, GEOBASE, Geo Abstracts, Google Scholar and Web of Knowledge. Articles in press are made available as soon as they are complete. These articles lack page numbers and should be cited as in press until the print version is published. Issue illustration: Scree skink (Oligosoma waimatense). Refer to the article by Lettink and Monks in this issue.